LHC Report: Positive ion run! You've received a Hallmark E-Card? Delete it! 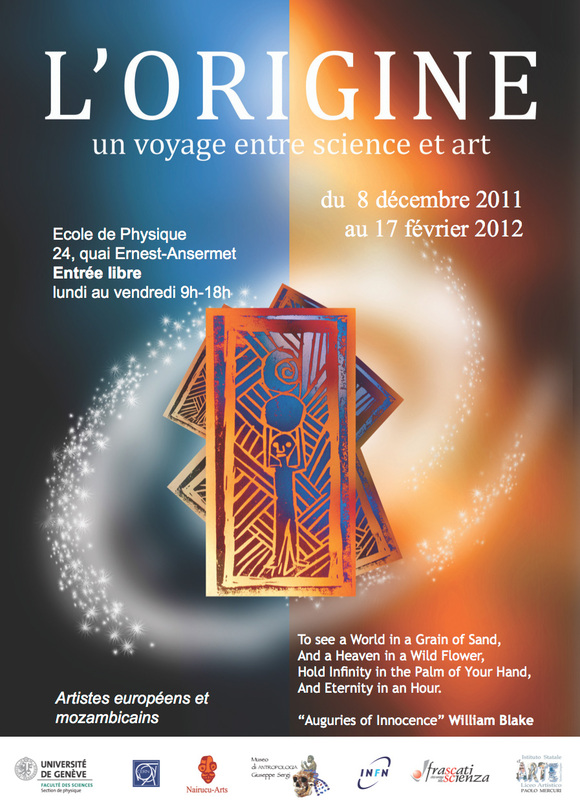 From 8 December 2011 to 17 February 2012, Geneva University's physics faculty will be holding an exhibition called "L'Origine – un voyage entre la Science et l'Art". Thirty artists from Europe and Africa will be exhibiting their work. The aim of the exhibition is to take the visitor on an imaginary journey to the origins of mankind and to show how science and art approach the same theme from different angles. The works on display will include pieces of Makonde art, a traditional art form native to Mozambique, created by artists of the Nairucu Arts centre. The cultural programme that will run alongside the exhibition will include lectures on contemporary scientific themes aimed at the general public. Visitors will also have the opportunity to discover "L’Origine", a book of poetry by Beatrice Bressan (Ed. Loreleo, Geneva, 2010), which was awarded the third prize in the “Poeti nella società” competition held in Basel earlier this year. "Recreating the first moments of the Universe and the events that led to the world of matter we live in today, identifying the forces that govern this world and looking for the missing link in the evolution of mankind are the most fascinating challenges of scientific research. At the same time, the question of the origins of the Universe has always inspired the imagination of artists," says Marilena Streit-Bianchi, a former CERN staff member who is helping to promote the exhibition. The exhibition is also associated with initiatives for the development of arts activities in Mozambique, including the creation of an art school. The members of the exhibition's organising committee are: Martin Pohl (University of Geneva), Marilena Streit-Bianchi (Nairucu Arts), Sergio Bertolucci (CERN), Beatrice Bressan (CERN), Giorgio Manzi (SAPIENZA, Rome University), Giovanni Mazzitelli (Frascati Scienza), Speranza Falciano (INFN), and Angelo Falciano (Istituto Statale Liceo Artistico “Paolo Mercuri”, Marino, Italy).